Curves to Kill...: Plaid, polka dots and braces oh my! Plaid, polka dots and braces oh my! Polka Dot and Plaid - two prints that I'm forever drawn to and always seem to purchase. Be it a jacket, dress or skirt, there is nothing better than a bold dot and a funky plaid in my books. Now that I'm completely smitten with a full skirt shape I thought I should show you my two favourite styles from Collectif. From the moment this popped up on the webstore I was drawn to the paneled waistband and dip feature. The Mary is full of stunning features : flocked black dots, removable braces and hidden pockets! I'm wearing this style in a uk16 and it's the perfect fit for my measurements. The waist band sits very high so be sure to take note of where you'll be wearing it and measure accordingly. I tend to go between 14's and 16's with Collectif and usually have less stretchy items in a 16. As you can see the flow of the skirt is perfect and it naturally hands in such a lovely way. I've paired this with my black Doris top but you can wear style this in so many ways. Cardigans, scoop necks and button up skirts. All black tops work wonderfully with this. I even had a Marilyn moment while shooting this skirt! It really does create that old fashion glamour style. Now this skirt is sold out in most sizes but there are 18's and 22's left. There is also a black version available if you're not into polka dots and hopefully both will be back in stock soon. Next is the Mini Liesel in check print. Last year I modeled and reviewed the longer length red gingham print skirt fell hard for the fit and flow. So when the mini version popped up on my screen I had to have it. Featuring a black and red check print that is to die for and matches everything in my wardrobe, braces and adorable bows at the waist. The shorter length is a great change from the longer length styles which are sometimes a little hard style more casually. The mini gives you more styling choices and pairs great with band tees and flats. The adorable addition of bows on the bottom of the detachable braces really tops off this design. I want both of these skirts in every possible print and colour no! I personally adore the mini because it shows off my legs and nips me in at the waist, accentuating my figure. 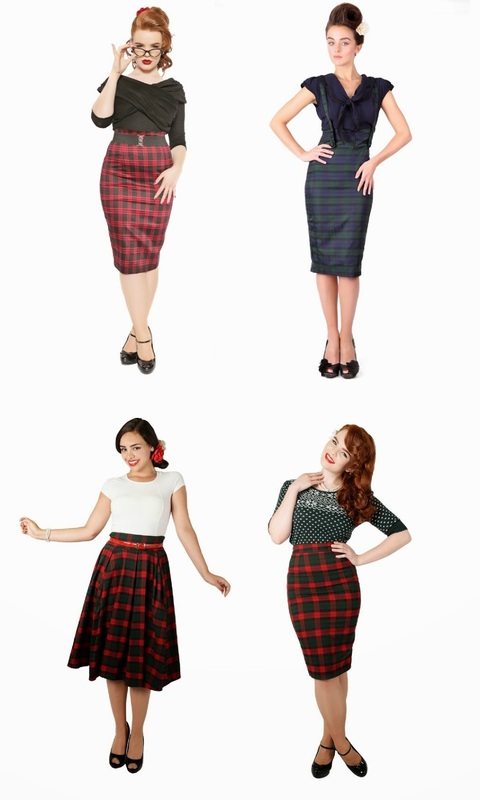 Collectif have a fantastic range of plaid skirts in stock and their A/W range is full of rich colours and prints. Bellow are my favourites. You can purchase all the items shown in this blog plus so many more stunning outfits and accessories. Order now for the perfect Christmas outfit or gift for a luck someone. Many Thanks to Alesich Photography for working with me on these and other images that will pop up soon! Check out his amazing illustrations, posters and creative photography! I love this man's brain bits. You look incredible! I have a dress by Collectif in this print and colour (the Regina polka flock dress). It is amazing, but because I'm short, the back doesn't sit right on my back - there's a bit of bunching up because the back of the dress is longer than my actual back. I'm just curious about how tall you are, because I'd love to have the skirt, if it isn't too too long on my legs.